Studio for 2 with basic kitchen, spa, pool & Bbq Excellent thank you. Sink could have been bigger, otherwise perfect. 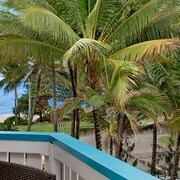 Situated near the beach, this resort is within a 10-minute walk of Four Mile Beach Park and Four Mile Beach. Macrossan Street is 2.2 mi (3.5 km) away. great hotel this is a beautifully, well maintained hotel. Its comfortable and the facilities are luxurious. Very nice. Lovely stay, friendly staff, Great location. The room was great and clean. We will stay again. The double pools was impressive. Not much else impressed us. 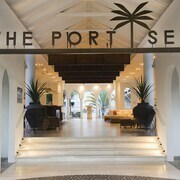 Looking for a place to stay in Port Douglas? Whether you're planning on a naughty getaway with bae, a break with your BFF or hitting it solo (cos why not! ), you'll find stacks of awesome hotels on lastminute.com.au. You don't have to stay anywhere else but in the thick of the action. There's an impressive 66 hotels within 2 kilometres of the centre just waiting for you to get your hands on. After a long day of sightseeing, kick back in bed with your favourite show at Coconut Grove or the Mandalay Luxury Beachfront Apartments. They're both a few steps away from the hustle and bustle. 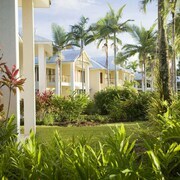 The Port Douglas Peninsula Boutique Hotel and the Cayman Villas are also worth your time. 4 kilometres out of the main centre is Four Mile Beach, which boasts 31 accommodation options. 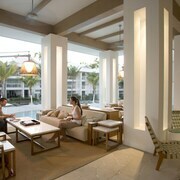 The Niramaya Villas and Spa and Pullman Port Douglas Sea Temple Resort and Spa boast some nifty amenities. Climb Flagstaff Hill to see the scenery from a different perspective. Mowbray by the Sea and Beaches Port Douglas are a couple of convenient options if you and your mates are wanting to stay in the vicinity. Court House Museum is certain to delight both history aficionados and design gurus. You can visit it whenever you like, especially if you're staying at the Verandahs and Peppers Beach Club. "Yaaas"! 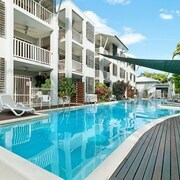 If you're cash poor, Port Douglas Backpackers is favourably situated and has some seriously good deals. 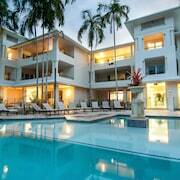 Alternatively, check out Global Backpackers - Port Douglas. 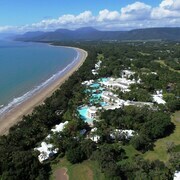 You might also like to try the Port Douglas Valley Retreat or the Silky Oaks Lodge. The Port Douglas Valley Retreat is 11 kilometres away from central Port Douglas, and the Silky Oaks Lodge is 13 kilometres away. More options include the Island Views, 35 kilometres away, and the Wait A While Daintree, 30 kilometres away. Always on the hunt for your next big adventure? The wider Tropical North Queensland region has some amazing things to see and do as well. Among Tropical North Queensland's natural wonders are its beaches and rainforest. After you've gotten your zen on in Mother Nature, have a look around art galleries. Eager for more? Common activities in this particular part of Australia include rock climbing and mountain climbing, so don't be afraid to have a crack! Kimberley is another place where you can kick back and acquaint yourself with the room service menu. Located 25 kilometres north of Port Douglas, it's where you'll discover the Tropical Sea Kayaks and Hook-A-Barra. 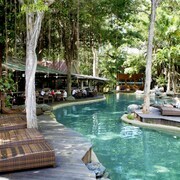 Some of our recommended Kimberley hotels include the The Epiphyte Bed & Breakfast and Daintree Rainforest Retreat. 30 kilometres to the north of Port Douglas you'll also find Forest Creek, which is home to the Lync Haven Rain Forest Retreat and Tea Tree Cottage. The Daintree Entomological Museum and Alexandra Bay Waterfall are among the more popular sites to see in Forest Creek. Wash away the long-haul hangover with a steaming hot shower at the Edge Apartments Cairns. It's within a quick drive of Cairns International Airport (55 kilometres from central Port Douglas), so you'll be feeling fresh as a daisy in no time!